You are here: Home / Articles / Suffering from Allergies? Your Pet May Be Too. Suffering from Allergies? Your Pet May Be Too. With Georgia coated in yellow pollen again, we are reminded of our allergies. But, keep in mind that your furry family members could also be allergic. Unlike humans, pollen is absorbed through the skin of animals so watch out for licking, biting, and scratching. The ASPCA recommends also looking for itchy or runny eyes, sneezing, and snoring due to an inflamed throat. If you find any symptoms in your pets, a trip to the vet will be the most effective solution. If you cannot make it to the vet, the ASPCA suggests some home remedies; wiping the coat several times a day with a damp towel to remove pollen, bathing them in hypo-allergenic shampoo, or administering allergy medication such as Benadryl. It is important to note that medication should only be given to pets under the counsel of a trained professional because of the possible dangers of differing doses and effects. If you recognize that your pet is experiencing symptoms out of pollen season, it is possible that they have another form of allergy. 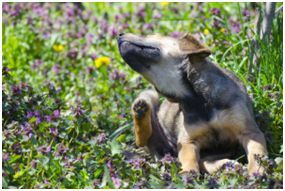 Some of the most common seasonal allergies for dogs are; dust, dust mites, grass, and flea bites. It is highly recommended that you visit your vet if allergy symptoms persist in your pets.